Lake Winnebago could see a third sturgeon spearing season in a row that goes the full 16 days. DNR Sturgeon Biologist Ryan Koenigs says they were out checking sites on the lake this week, and the water quality is very poor. “On average you’re probably only looking at 6-to-7 feet of visibility right now,” he says. Koenigs says that’s “well below the threshold” that’s normally needed for those hoping to spear a sturgeon. Typically, visibility of around 12 feet is needed for there to be a high harvest on Lake Winnebago that can call an early end to the season. Koenigs thinks there’s a good chance harvest caps will not be reached until close to the end of the season, if they are reached at all. The last two season Lake Winnebago have both gone the full 16 days. 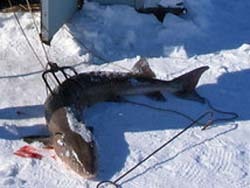 The Sturgeon spearing season starts Saturday.